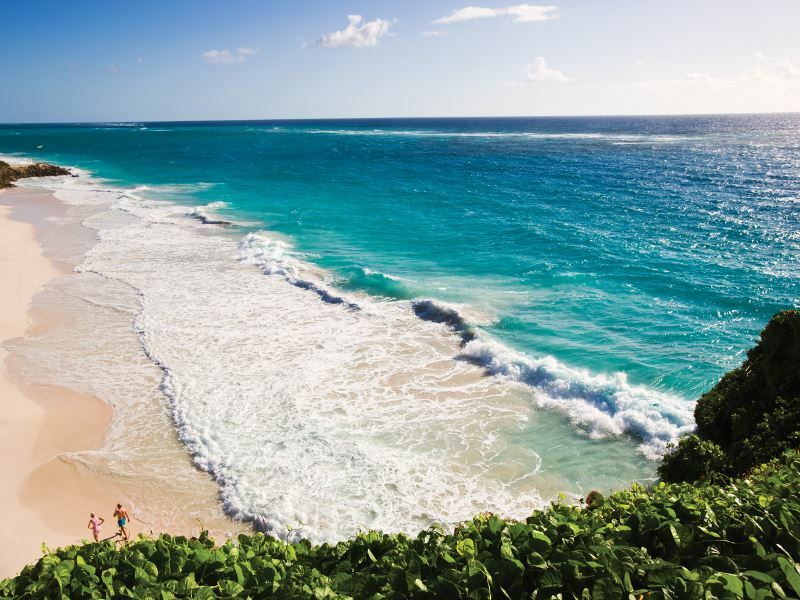 Barbados is a tale of two coasts: the calm Caribbean with its dazzling turquoise-tinted waters and sparkling sands and the wild Atlantic with its rugged windward shores and world-class waves. Given its small size (just 21 miles in length and 14 miles in length) there’s a fair amount of beaches on offer, all of which have their own unique charm. We’ve worked our way around the island to scope out the very best. Powered by crashing waves, dramatic limestone cliffs, staggering rock formations, natural plunge pools and empty expanses of windswept sands, the wild and rugged Atlantic-whipped east coast is hugely different to the rest of the island. With its natural hiking trails across wild headlands, spectacular sunrises and sunsets, and refreshing back-to-basics vibe, it’s easy to see why Barbadians tend to spend their holidays on these shores (many have second homes here). 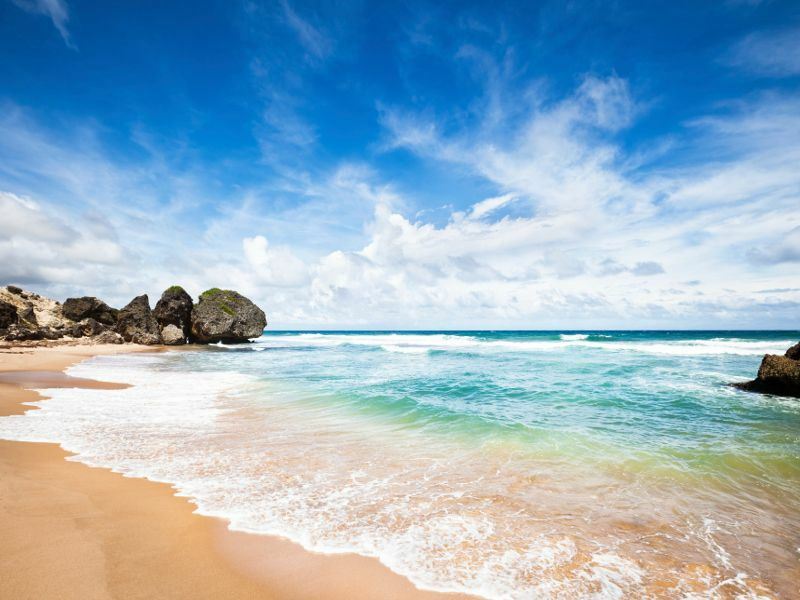 One of the big-hitters is Bathsheba Beach - the surfing hotspot that also gets the glory for its dramatic sweep of golden sand, giant boulders, nodding palms, foamy Atlantic breakers, and panoramic vistas. But the real celebrity is the adjacent swell known as the Soup Bowl - an epic right-hand point break that attracts devoted boarders from across the globe to its local and international championships. But if shredding up the surf and cutting through waves isn’t your thing, Bathsheba Pools is perfect for a relaxing soak in one its shallow inshore pools. There’s more rugged grandeur to be found on Martin’s Bay, Bath Beach and Conset Bay, all of which are ideal for those keen to while away the hours watching the Atlantic waves pounding the shores (these red flagged-waters are largely unsafe for swimming due to the strong and unpredictable undercurrents). Equally visit-worthy is the mile-long Cattlewash Beach for its paradise-like sands, cool trade winds and superb beachcombing, and Morgan Lewis Beach for its remoteness - you can almost guarantee the beach will be deserted when you arrive. Head further south and you’ll hit Crane Beach - the East Coast scene-stealer that sits pretty right where the Atlantic and Caribbean collide. 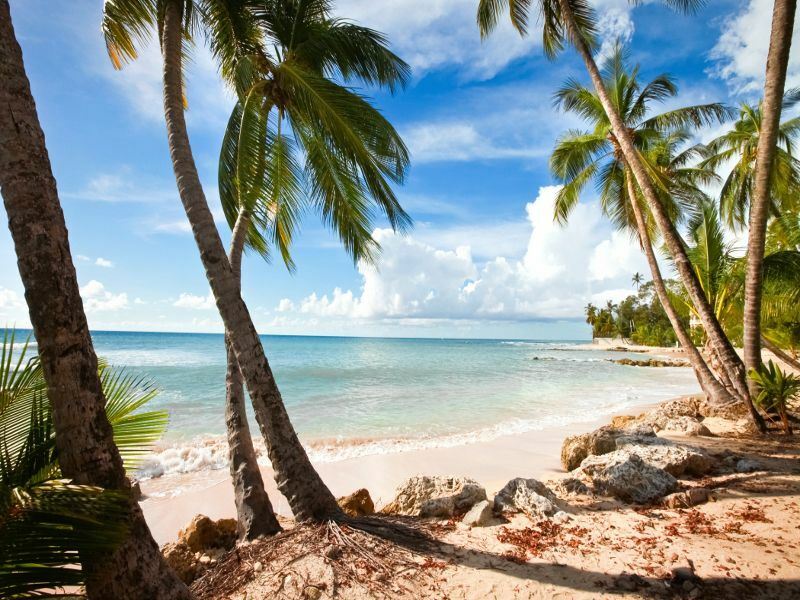 Arguably Barbados’ most stunning beach, this high-ranking crescent moon of pale pink-tinged sand licked by turquoise-coloured waters gets all the love for its jagged limestone cliffs, lush coconut grove, mighty breakers, and profoundly historic Crane Resort that’s been a Barbadian icon since 1887. Nicknamed the Platinum Coast for its exquisite white sands and blinged-up clientele (around 18 global billionaires have homes here), the island’s upmarket West Coast is the last word in refined tropical glamour. 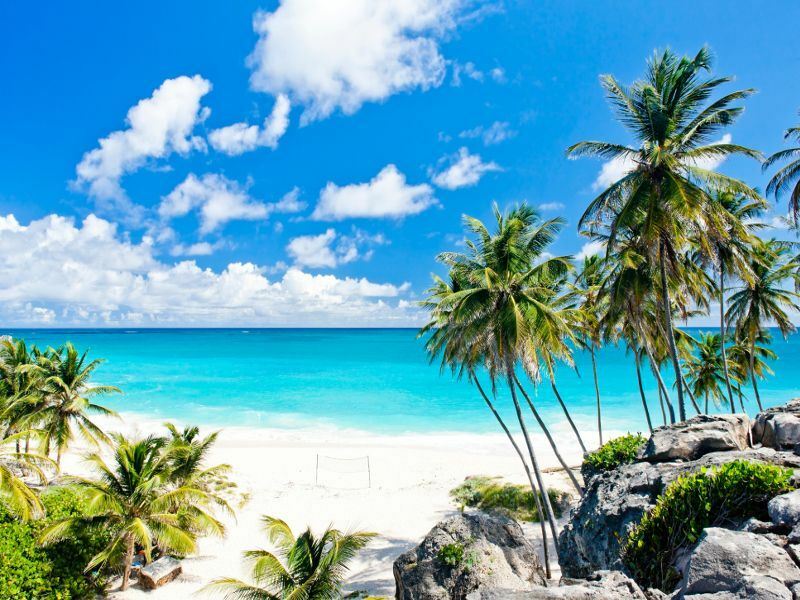 It’s also where you’ll find some of the island’s most Insta-worthy beaches, all of which (in accordance with Barbadian law) are for public use. Possibly the most exquisite is Sandy Lane Beach, the playground of the rich and famous best known for its eponymous hotel. Aside from staking out bona fide A-listers, you can laze on glittering white sands backed by swaying palms and swim in calm-as-you-like turquoise Caribbean waters that are bathtub-warm. Another get-away-from-it-all West Coast pleaser is Paynes Bay, mostly for its quiet surf, snorkel-worthy azure waters packed with small fish, excellent watersports (jet skiing and catamaran sailing), watchful lifeguards, and relatively easy parking. There’s also the star-studded Mullins Beach for its 300-yard-long stretch of idyllic soft golden sand and super-safe swimming, Gibbes Beach for its privileged location and pristine sands lined with multi-million-pound villas, and Batts Rock Beach for its picnic tables, children's playground, and tropical simplicity. Further south, the historic Carlisle Bay (named for Barbados' second Lord Proprietor James Hay, 1st Earl of Carlisle) exceeds expectations with crystalline waters, ribbons of golden sands, a choice of six dive-worthy wrecks (Berwyn, Ce-Trek, Eillon, Bajan Queen, Cornwallis, Barge) and two beautiful beaches: Brownes Beach and the adjoining Pebbles Beach. Head here for a pristine sun-sea-sand combo before heading to Needham’s Point Beach or Drill Hall Beach to seek out livelier waves that lend themselves to boogie boarding and surfing. For an alternative to the well-worn sandy delights, there’s Reeds Bay on Lower Carlton Beach for sun-kissed contours and marked swimming areas, Holetown Beach for kayaking, waterskiing, jet skiing and a buzzy vibe, and the blissfully uncrowded Paradise Beach (the original the site of the Cunard Paradise Hotel) for shallow rock formations and waters that are more placid. 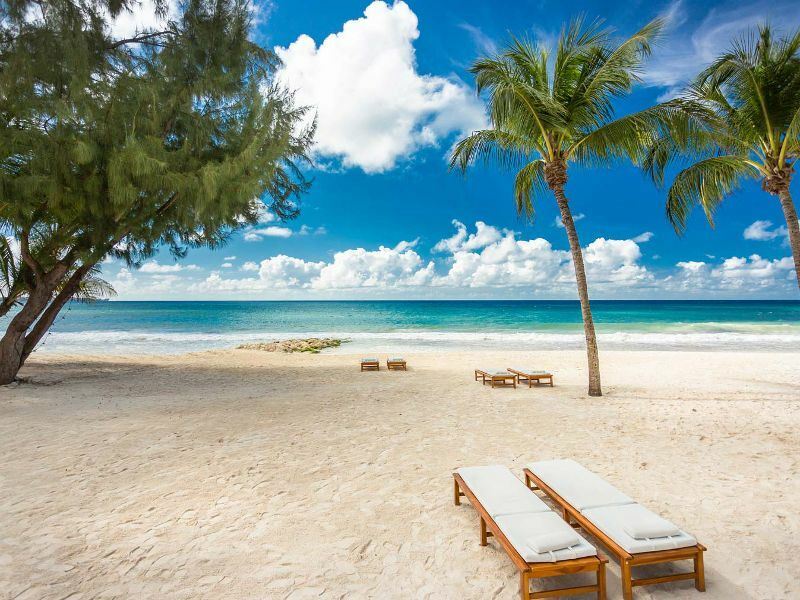 Unquestionably more laid-back than anywhere else in Barbados, the up-and-coming South Coast (nicknamed the Fun Coast) attracts beach-lovers to its palm-fringed sands, shallow-water reefs, and waves that that more powerful than the west but less pounding than the east. Silver Sands (also known as Silver Rock, Round Rock or De Action Beach) is the island’s top windsurfing spot and most celebrated for its deAction Barbados Waterman Festival - the annual surfing (paddle, wind and kite) and paddle boarding competition that’s taken place here since 1989. There’s also first-class sands for daytime lazing and waters that are a tad choppy but sill swimmable. Most rewarding for body surfers and boogie boarders is Accra Beach (also known as Rockley Beach) - an eye-catching combo of exciting waves, calm waters, and a long curve of white sand fringed with tall casuarinas, sea grape, and coconut trees. Away from the water, make a beeline for the new mile-long South Coast Boardwalk for easy to access to Hastings Beach - a supercool spot adored by locals for its gently sloping sea shelf, tropical fauna, luxuriously warm waters filled with triggerfish, eels, and turtles, and excellent one-day catamaran cruises. Those looking for even more impossibly idyllic velvet sands should not miss a visit to Bottom Bay - one of the island’s most-photographed coves that’s flanked by high coral-lined cliffs, fine-grain pink sands, and crystal waters in a thousand shades of blue. Equally striking is Miami Beach (also known as Enterprise Beach) for its 250-yard-long strip of white sand, big waves, sheltered and shallow spots for bathing, and ample shade from the blazing sun. 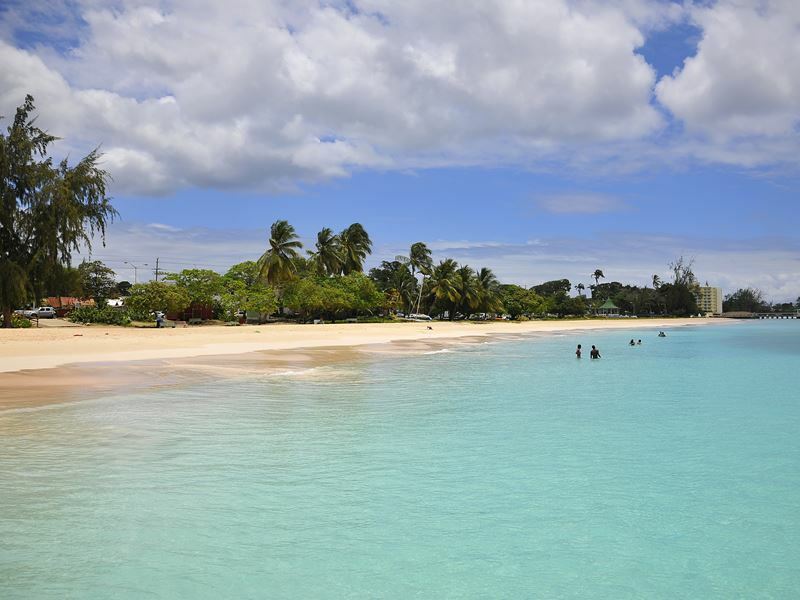 And of course, no trip here is complete without a spot of horizon-gazing at Dover Beach - a South Coast staple for its transparent waters ringed with buoys for extra security, extra-wide sands, and superb selection of watersports. Spend your time cutting through the waves on a jet ski, riding a dual-hulled sailboat, snorkelling with sea turtles, and swimming with colourful tropical fish. Alternatively, choose to stay dry by curling up with a good book on a sunlounger - or watching the locals play cricket or Bajan football at the Dover Playing Field right next door.